Coastal communities are at the frontline of a changing climate. Escalating problems created by sea-level rise, a greater number of severe coastal storms, and other repercussions of climate change will exacerbate already pervasive impacts resulting from rapid coastal population growth and intensification of development. To prosper in the coming decades, coastal communities need to build their adaptive capacity and resilience. 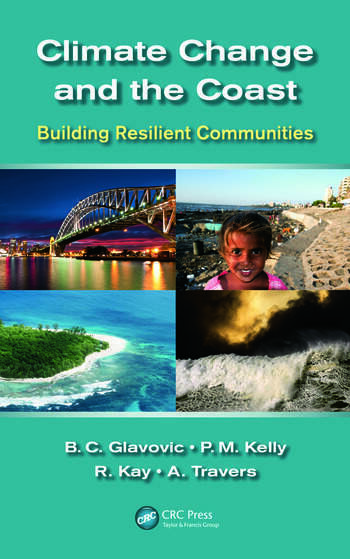 Telling the stories of real-world communities in a wide range of coastal settings, including America’s Gulf of Mexico coast, Britain, Australia, New Zealand, The Maldives, southern Africa, Bangladesh, and Vietnam, the case studies in Climate Change and the Coast: Building Resilient Communities reveal a rich diversity of adaptation approaches. A number of common themes emerge that indicate opportunities, barriers, and on-ground realities for progressing adaptation at the coast. Together, they highlight the need to consciously reflect on current circumstances, contemplate future prospects, and deliberately choose pathways that are attuned to the changing circumstances climate change will bring to coastal regions. This process is termed "reflexive adaptation," capturing the principle of critical self-reflection and self-correction in the face of adversity, uncertainty, surprise, and contestation. Climate Change and the Coast: Building Resilient Communities will interest those concerned about the future of coastal communities. It shows what has succeeded and what has failed around the world, and where there are opportunities to be grasped and pitfalls to be avoided. It will be invaluable to those involved in enabling adaptation to climate change, including policy-makers, coastal managers, day-to-day decision-makers, students, and researchers. Looking forward, what makes this place at particular risk from future climate change and other potential threats? What can be learnt from past experience? What will help and what will hinder climate change adaptation at the coast in Brazil? What will help and what will hinder? Bruce C. Glavovic holds the EQC Chair in Natural Hazards Planning at Massey University, New Zealand. His research explores the role of governance and land-use planning in building resilient and sustainable communities. He has over 25 years of experience in academia, private consulting, and government, mainly in the Republic of South Africa, the United States, and New Zealand. He is currently vice-chair of the Land–Ocean Interactions in the Coastal Zone (LOICZ) Scientific Steering Committee. Robert C. Kay is principal consultant of Coastal Zone Management Pty (Ltd) and of Adaptive Futures, Claremont, Australia, two niche consulting companies advising governments, communities, and companies worldwide on the challenges posed by climate change impacts. Dr. Kay has 25 years of experience in climate change impact assessment, coastal zone management, and planning through work in government, consulting, and academic sectors. He holds a position of visiting adjunct professor at the Sustainability Research Center at the University of the Sunshine Coast, Australia. He has an honours degree in geology (Wales) and a PhD in environmental science (East Anglia, UK). Philip Michael (Mick) Kelly is a consultant with Tanelorn Associates based in New Zealand’s winterless north. Having retired from the Climatic Research Unit at the University of East Anglia in the United Kingdom, where he specialized in research on mechanisms of climate change and climate vulnerability, he now manages 69 acres of regenerating bush and is committed to community-based science projects. Ailbhe Travers is a coastal geomorphologist with over ten years of experience in environmental studies, focusing specifically on the coastal realm. She holds an honours degree in environmental science (University of Ulster) and a PhD in geography and environmental systems engineering at the University of Western Australia. "Most of the thousands of books about climate change and coastal impacts have either a thematic focus … or they treat specific areas or regions. This book offers 22 case studies, presented by 50 diverse authors, that represent most oceans and seas of the world. ... Summing up: Highly recommended. General readers; upper-level undergraduates through professionals/practitioners." "This book brings together more than 50 authors to explore challenges and opportunities for building the resilience and sustainability of coastal communities in the face of climate change. Case studies from different regions make it highly relevant to a wide range of scholars and practitioners. The emphasis on practical adaptation strategies and coastal governance is very timely and important." "The book is not prescriptive in its conclusions — it encourages diversity — but it is clear that living with risk will be an increasingly central element of life and development planning on the coast. Planners, students and residents of the coast will value this book for its clarity, comprehensiveness and messages for the livability of future coasts." "… contains case studies from all major world regions. … The specific focus on coastal adaptation/resilience – as opposed to a general treatment of coastal management (with a minor subtext of climate change) or a generic treatment of adaptation (with maybe one or two coastal examples) is of particular interest to me – and likely many others working in coastal environments. I also appreciate the roles the editors have played in coastal adaptation over the better part of 2-3 decades. It smells like experience, and thus credibility." "This is an important volume that is unique in its breadth of case studies, authoritative authors, and comprehensive coverage of the science and governance of adaptation to climate change on the coast. It is practically focussed, and provides the reader with a wide range examples of adaptation processes from around the world".